When you are someone who has had to build up self-worth, and rise above a lot of negative stuff, it’s easy to see why you would want to shine. 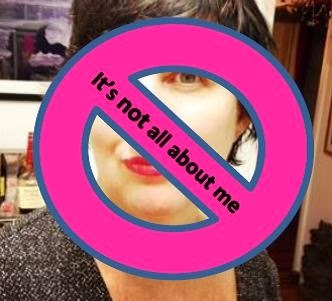 There’s someone in my house who always tells me, that “it’s all about me” (in a good way) and of course it is, why wouldn’t it be. This chapter talks about letting others have the glory. And by glory, I don’t mean morning glory - the type that when you wake up, the bed’s been turned into a tent, but the glory of letting someone else have the spotlight. Letting someone else take the stage and enjoy their moment, while you watch and listen with genuine interest - without turning the moment around to yourself. But, I do like to share a lot of stuff, in fact I probably overshare, but that doesn’t mean that I don’t care about what others have to say. I think it’s a good idea for my future more relaxed gracious self to start putting the spotlight on the other person. Will that be hard – probably, will I give it a go – definitely! Will it do anything? I don’t know, that remains to be seen but apparently, I will look forward to gaining a quieter inner confidence. Note to self: It’s not all about me, all the time, but that's okay, cause when it is about me, it's gonna be all about me.